Our sedentary lifestyle is shaving minutes off of lives every day. We sit at desks which only burns one calorie a minute and is truly detrimental to our health. So, it is imperative to know the super foods that will counteract this inactivity and give a net gain of time added to your life. The key to extending your life is lowered inflammation, healthy weight maintenance, and not being overrun by negative stress and depression. The following foods have the key elements to accomplish those goals. What’s more there are many other health benefits that will improve the quality of your extended life. Cherries are full of unique anthocyanins and other compounds that naturally mediate the inflammation in the body. These and some other deeply colored berries, fruits, and vegetables are super foods and contain nutrients that combat inflammation. While all cherries pack an anti-inflammatory punch, tart cherries contain higher levels of the flavonoid anthocyanin. Your mom was right to make you eat your Brussels sprouts! Cabbage, bok choy, Brussels sprouts, and cauliflower reign supreme with cutting down inflammation. See also: How Urgent Care Centers are Different from Freestanding Emergency Rooms. There is a clear cut difference between inflammation levels in individuals who consume cruciferous vegetables regularly as opposed to those who do not. Chronic inflammation is one of the leading causes of cancer. Legumes, most specifically lentils, are the superheroes of cancer prevention. They have an abundance of phytochemicals, vitamins, and minerals. One of the most important nutrients of all legumes is dietary fiber. The presence of fiber in all legumes is one of the essential nutrients to combat inflammation. Not to be eaten raw due to toxic compounds, cooked green tomatoes are vitamin and mineral dense. These nutrients ward off cell degeneration which occurs with time and sedentary lifestyles. They are great post workout foods because the active, valuable compound tomatidine is a muscle builder. Muscle atrophy occurs naturally with aging. Cooked green tomatoes’ tomatidine works against that process extending your life. One of the keys to maintaining a healthy weight is eating nutrient dense foods or super foods that will keep you fuller for longer periods of time. Protein and inflammation fighting fiber are the nutrients that have many health benefits and will keep hunger pangs at bay. Swapping out high saturated fats for healthy unsaturated fats will also help with maintaining a healthy weight. This antioxidant super food fights and prevents cancer, heart disease, high blood pressure, diabetes, arthritis, and the list goes on. It combats obesity despite its high caloric content. Instead of butter and margarine which lack nutrients, use olive oil which is rich in phenolic antioxidants. These antioxidants are also found in honey, the majority of legumes, berries, cruciferous veggies, green tea, onions, chocolate, red wine, among others. These antioxidants combat inflammation as well. The monounsaturated fat content in olives and olive oil has been found to enhance the body’s breakdown of stored fat equaling weight loss! With these exotic whole grains, your palette and your hunger will be satisfied. 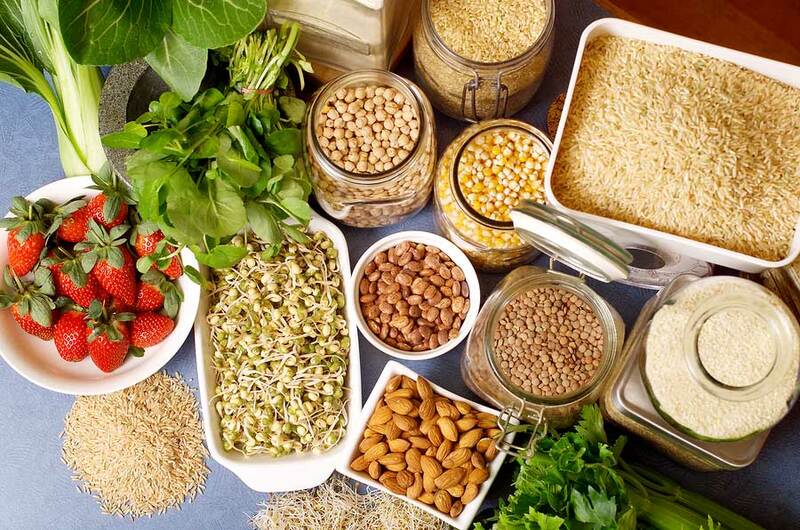 Along with being high in hunger fighting protein, these grains are known for controlling and preventing diseases such as diabetes, certain colorectal cancers, and macular degeneration. You’ll live longer and will be able to see which is a bonus! Replacing wheat with freekah and teff will give you immediate benefits. Substituting rice with quinoa is a smart move. These grains are clear examples that all carbs are not bad. Depression is caused by imbalances in brain chemicals especially serotonin and dopamine. There are various triggers such as substance abuse, emotional trauma, vitamin deficiency, and physical diseases that can negatively impact this balance. Strategically including the following super foods to your diet will increase key brain chemicals that boost your mood and thwarts the imbalances that cause the doldrums that shorten lifespan and make it unbearable to boot. Vitamin B12 and zinc are immediate mood boosters and are found in most shellfish such as clams and oysters. Vitamin B12 is used by the brain to make dopamine and serotonin which are the “happy” chemicals. Zinc is present in brain cells and helps create new brain cells.